After the fight Garcia stated, "For this training camp, nothing changed. I'm training with Eddy Reynoso, one of the best trainers in the world right now. My improvements are even going to get better and better, my fights are going to get better and better, and the competition is going to get better. And I'm going to be ready for it." 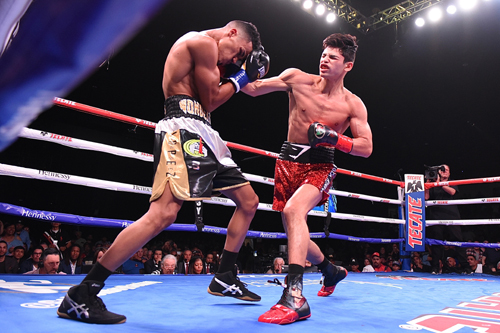 Light flyweight Angel Acosta (20-1, 20 KO’s) uncorked a left hand on the chin of Ganigan Lopez (35-9, 19 KO’s) in round eight and that was all she wrote. Lopez fell to his hands and knees and stayed there until the count of ten, he could not proceed. Up until then Acosta was in charge of a pretty ho-hum fight. 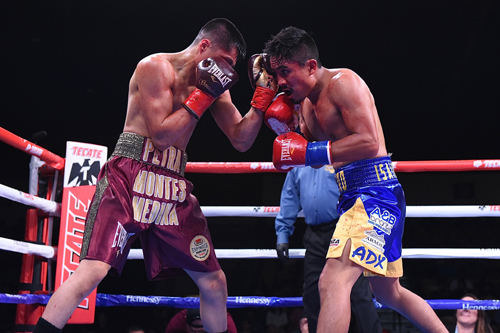 Lopez had a plan to attack the body but instead looked to be in survival mode while Acosta was banking rounds. 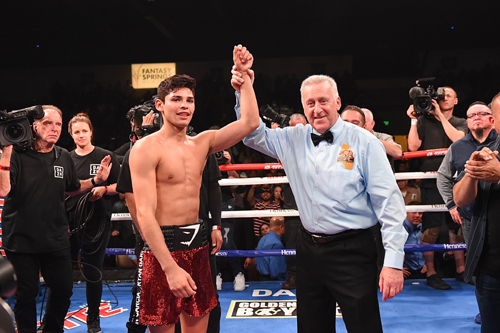 The KO at 1:59 of round eight sealed the deal for Acosta snagging the World Boxing Organization World Light Flyweight Title. The victorious Acosta stated, "Yes we did all the work that we did in the gym. Ganigan came here very intelligently. he knew how to move and how to make punches, especially after the first round when I hurt him." The casino fire alarms were blaring loud and clear throughout the house prior to the fight and now we know why. The bells and whistles announced the power that Super featherweight Eduardo Hernandez (28-0, 25 KO’s) would bring into the ring against Ibrahim Mgender (22-6, 10 KO’s). 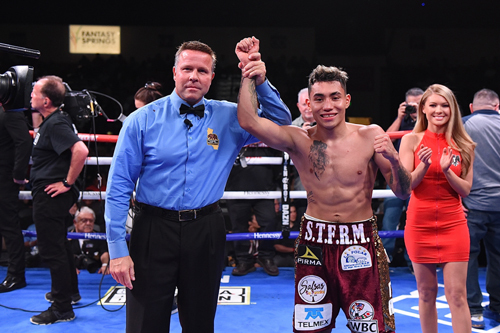 In less than two rounds the KO specialist from Mexico made his USA debut with a stunning 2nd round stoppage over his Tasmanian foe. A left hand dropped Mgender early in the second and a right uppercut moments later would be the clincher. Hernandez was done with his work at the 1:58 mark of the second stanza. 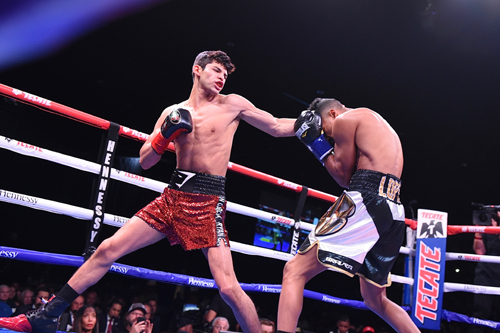 Featherweight Joet Gonzalez (22-0, 13 KO’s) came out like gangbusters in round one and it looked like curtains for Rodrigo Guerrero (26-8 -2, 16 KO’s) who was dropped late in the round. 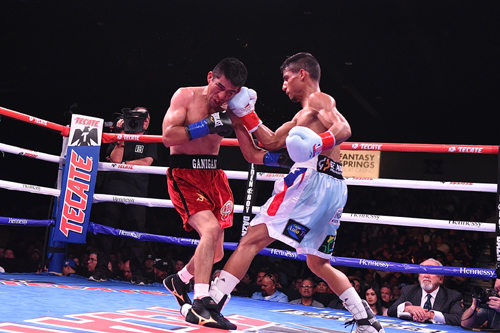 But Guerrero not only survived but came back to give Joet something to pay attention to over the next few rounds. But Gonzalez stayed focused and kept up the attack. Guerroero went down again in round 4 from a great body and head combo. In the ensuing round Joet finished the show with a brisling attack that saw the ref halt the action at the 2:27 mark. 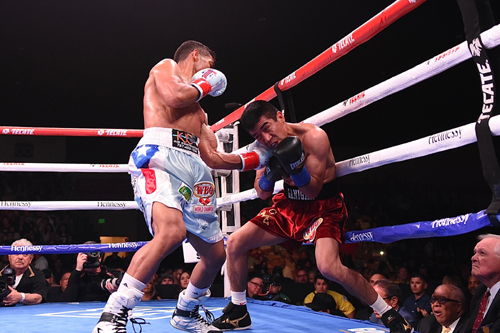 With the victory Gonzalez picks up the World Boxing Organization NABO Featherweight Title. One his KO performance Joet said, "It feels great. He's never been knocked out, never been stopped, and I was the first to do it. I came in with a game plan, with my mind set that I was going to be the first one, and I did that." 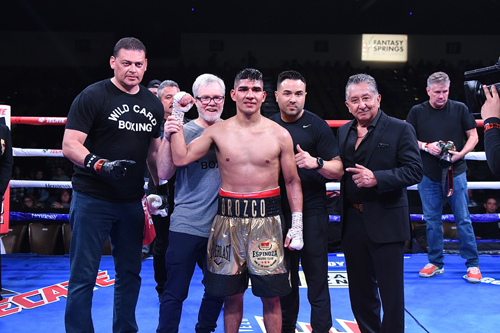 Coming into the fight after suffering his first loss Antonio Orozco (28-1, 17 KO’s) needed all ten rounds to secure a unanimous decision victory over Jose Luis Rodriguez (25-13 -1, 13 KO’s). 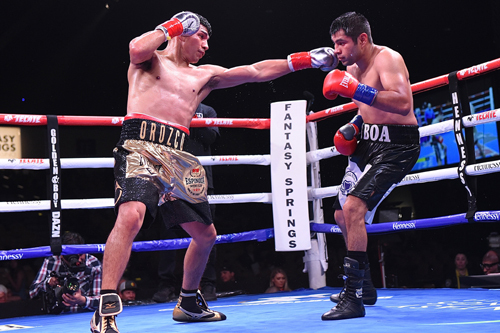 Orozco needed the work to get back on track but the performance was lacking at best. Credit goes to Rodriguez for making a good fight out of the battle. Final score all in favor of Orozco read 99-91 and 97-93 twice. After the fight Orozco noted, "This was my first camp with Freddie Roach, and it was a lot to absorb. Overall, we got the win, and that's what is important. We are back in business, and debuted on DAZN." 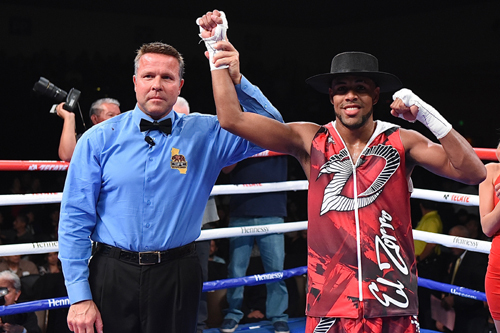 If Puerto Rico is looking for the next Miguel Cotto or dare I say Tito Trinidad then Welterweight Danielito Zorrilla (11-0, 8 KO’s) may be someone to take a look at. 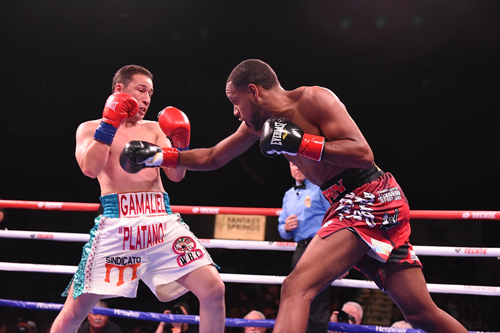 Gamaliel Diaz (40-20-3, 19 KO’s) was on the receiving end of a good old fashioned beating in this one. Look for the name Zorilla in the future, he is one to watch. Officially the fight was stopped at the 2:59 mark of round 2. Super welterweight Neeco Macias (17-2, 10 KO’s) was looking to get back on the winning tack but Jeremy Ramos (11-6, 4 KO’s) had other plans. 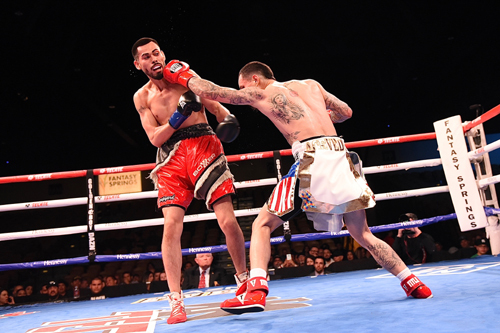 In a close quarters fight that could have taken place in the proverbial phone booth Ramos got a split decision nod over The Rooster with scores that read 77-75 for Macias and 78-74 and 77-75 for Ramos. 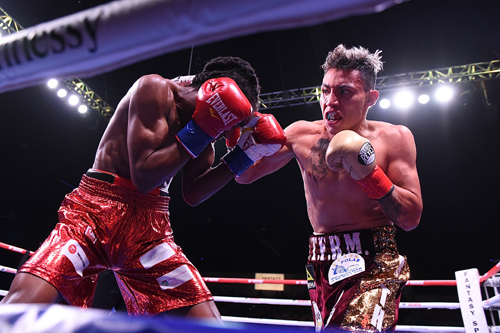 In the quintessential walkout bout Super lightweight Herbert Acevedo (15-2, 6 KO’s) took on Alfonso Olvera (11-5-1, 4 KO’s) in a hard fought battle. 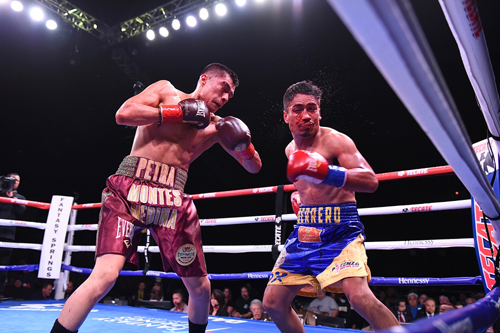 The fight that went to eight round distance was scored a split decision draw 77-75 Acevedo, 77-75 Olvera and 76-76 even. 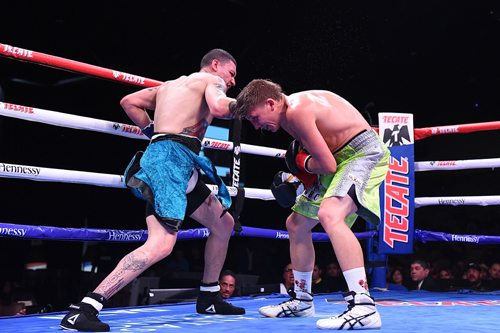 Welterweight Aaron McKenna (7-0, 4 KO’s) used an overwhelming arsenal of punches against Loretto Olivas (3-1, 1 KO). It was an impressive display of boxing skill as McKenna completely outclassed his foe from pillar to post. 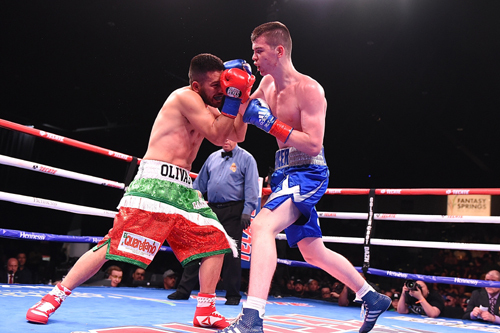 Working behind a stiff jab and fine body work the young Irish fighter took another step forward in his quest to become a champion. Judges tallies had it 60-53 across the board.